TSE 122: Three Effective Ways To Be Known Liked & Trusted | The Sales Evangelist! 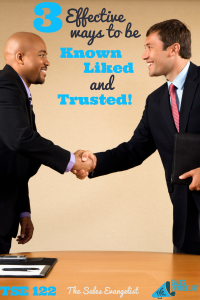 We have all heard it before that people buy from those they know, like and trust! Yes, I totally agree with this statement as well, but there is one problem HOW? How does one build relationship with a perfect stranger to the point where they know, like and trust you? Well, this is why I’m doing this episode. After really thinking about this topic, analyzing my past business/personal relationships, I came up with three ways we can easily build relationship with others to get known, liked and trusted. Now, obviously strong relationships takes time and effort but doing these three things will help you see incredible results. There is something contagious about having a smile on you face. Studies show that when you smile, others will naturally return with a smile. A smile also makes you look more excited and confident in what you are doing. This translate to the prospect that you are passionate about your offering, thus generating a sense of curiosity in the prospect to learn more. Now, I’m not telling you to go out and smile like a circus clown. But a nice warm smile will go a long way to help prospects take down their defensive guards. According to the great Wikipedia, “Mirroring is the behavior in which one person subconsciously imitates the gesture, speech pattern, or attitude of another”. So how can mirroring help you get known, liked and trusted from your prospects? Well, people tend to like others who they feel a connection with, someone who is like them. When you mirror, it reflects that you are in sync with others and are like them in some way. This subconsciously allow the prospect to open up a bit more. However, don’t get the idea that you should copy every thing the other person does, but pay attention to the mood of their body language and reflect that in your posture. If their legs are crossed, you should cross your legs as well. Maybe a hand gesture on their face or the tone of their speaking. There are many different ways you can do this. Try it with family members and friends and see how much fun it is. This is also a very simple thing you can do and it relates very closely to the idea of mirroring. Essentially it shows that you are human and can sympathize with them. So many times well meaning sellers go into a meeting so cocky that it becomes a turn off. They put themselves above their prospects and makes the prospects feel inferior. Many times this happens when the sales person start using buzz words and terminology that the prospect does not understand. And once that happens, the meeting with be over and the sales persons will be dismissed with a statement live “leave some literature and I will get back to you”. Don’t be that type of seller! Speak the prospects language. Explaining your product or service in away that relates to their business. Give examples that tie to their industry, success stories of companies like them. Before you meet with them, do some research via LinkedIn (social media) and see if you have anything in common. This is a great way to take down the barriers that prospects have up initially. Overall, the more people feel you are relatable (like them), the more they begin to trust and open up to you. Doing these simple activities of smiling more, mirroring your prospects and being relatable, you will increase you chances significantly to being known, liked and trusted. Try it and let me know how it works for you. 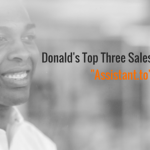 Drop me am email at Donald@thesalesevangelist.com. 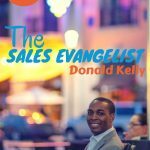 You can also join in on some of our other sales conversation in our private Facebook group, The Sales Evangelizers. Either way, I can’t wait to hear from you. In the mean time, remember to DO BIG THINGS!